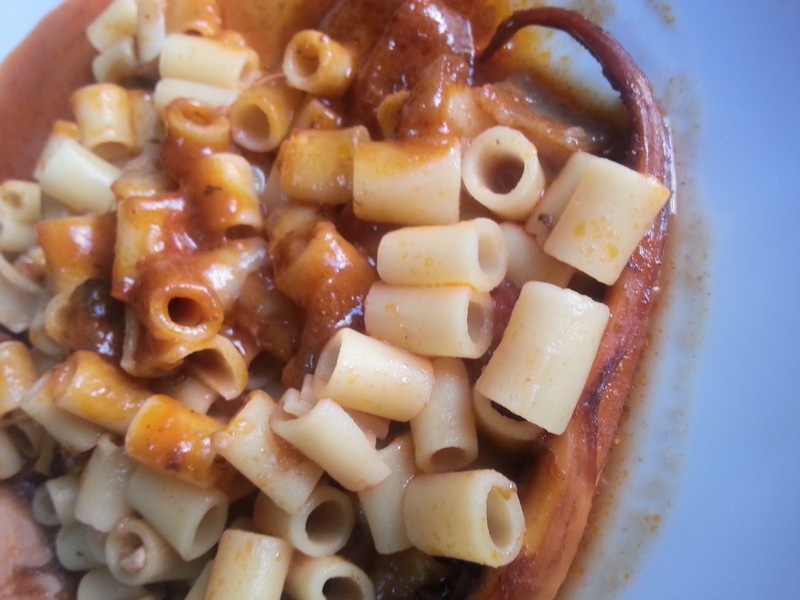 Octopus and Pasta Bake, if you're a true seafood lover then this dish is definitely a must try!! 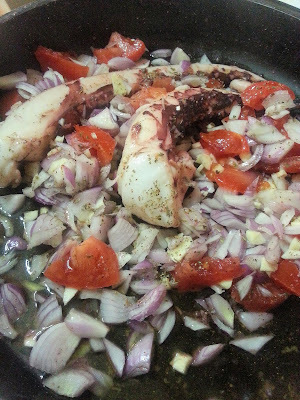 The savory juices that are extracted by the octopus while it simmers in red tomato sauce and slowly baked in the oven oh! 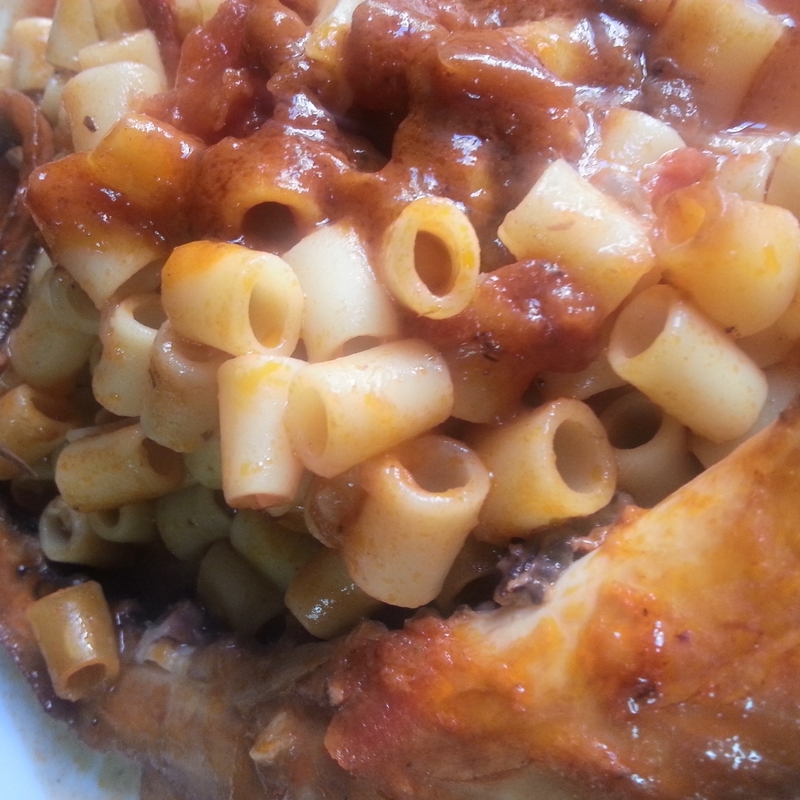 so mouthwatering.... Octopus and Pasta Bake is a favorite dish among, almost all Greeks during lent. Hey, I don't only cook it during lent, it's a great summer dish! My mother cooked this scrumptious meal and we couldn't wait to sit down. 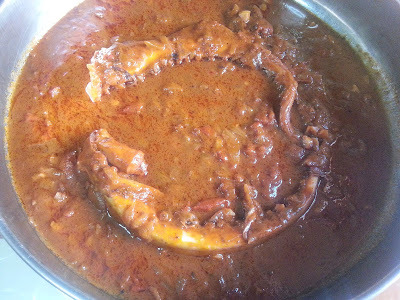 Reminiscing a bit, I used to take my fork and swiftly before my mom could catch me I would grab a piece of the octopus right out of the pot ( she always hated this) but the scent of fresh octopus simmering was just so tantalizing I couldn't resist. Now on to the recipe. You can use any pasta you like but ditalini is the traditional way. Rinse your octopus very well, if your octopus has a hood open it up and clean it and make sure there's no sand in the suction cups of the tentacles. If you would like you can cut your octopus in bulky pieces (octopus shrinks as it cooks) I didn't I cut the octopus until after it was cooked. Place your octopus in the pan on low heat, juices will be extracted keep stirring until all juices have evaporated, use a wooden spatula. Keep in mind the octopus will change color. Once the juices have almost evaporated add your olive oil, make sure it covers the bottom of your pan. Saute for about 5 minutes. Then add your chopped up tomatoes,and onions saute for about another 5 minutes. Stir until your onions have a golden color. Some people add rosemary, bay leaf, allspice etc. I don't, I just add pepper, oregano and garlic and I saute for another 3 minutes or so. At this point I usually add red wine. When you add the red wine allow it to boil and almost evaporate before you add the water. I didn't add wine this time. I just covered with water and allowed it to boil on high for about 1 hr or until the octopus was tender. 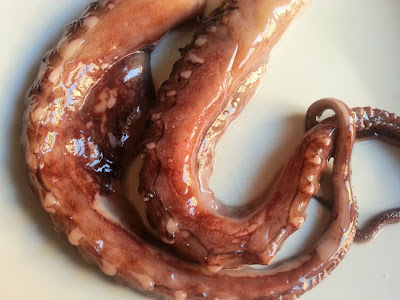 If after an hour your octopus isn't soft then just add more water and allow to keep boiling. When your octopus is tender and it's almost ready to simmer add your tomato paste and allow to simmer into a thick sauce. TIP: Don't add salt or it will make your octopus tough and hard to swallow. If you would like add a tiny bit at the end. 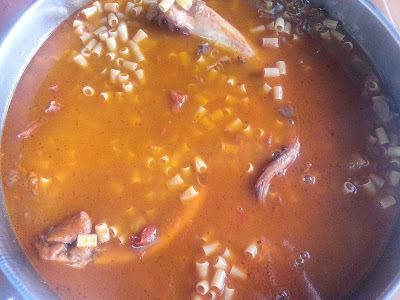 When your sauce is ready empty contents into your pan add your pasta and cover with water. TIP: Cover with aluminum foil or parchment paper. Preheat your oven 1/2 hour before, place your pan in the oven. Cook for about 30min. or until pasta is Al dente Stir occasionally always with a wooden spatula. When it is almost ready you can add 1 tablespoon of tomato paste, your salt & pepper to taste. and a tall glass of refreshing red wine, an ideal combination. KALE OREXI! Another mouthwatering dish from my kitchen to yours!